If you perform these or similar processes, you know the importance of control. 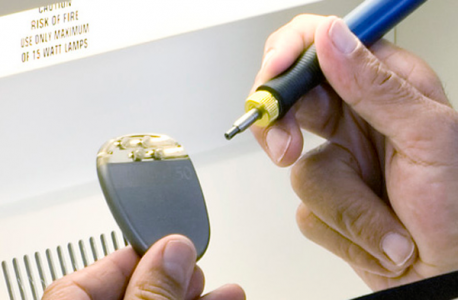 Medical manufacturing must meet strict industry standards, which means medical implants and devices require a surface refinement tool that delivers pinpoint precision and repeatable results. For over 50 years medical manufacturing has used MicroBlasting to clean, deburr, texture and prepare surfaces finishes on delicate, intricate and small parts. MicroBlasting is a versatile process, and its application continues to grow within the industry as new products are brought to the marketplace. MicroBlasting is shorthand for a process known as micro-precision sandblasting and micro-abrasive blasting. 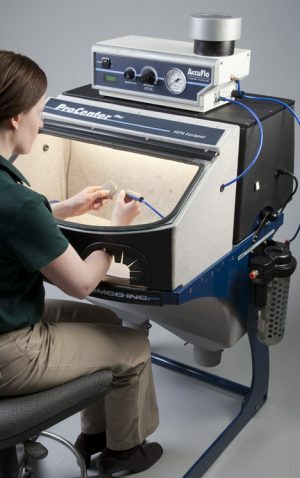 It is sandblasting on a micro-scale and used to refine and alter surfaces on small, delicate, and high-value parts. MicroBlasting technology is designed to benefit parts as small as a grain of rice to as large as a basketball. The MicroBlasting process requires two primary components: very fine abrasive and dry, compressed air. A micro-precision sandblaster mixes air and abrasive and sends the mixture through a small, focused nozzle at a high velocity. 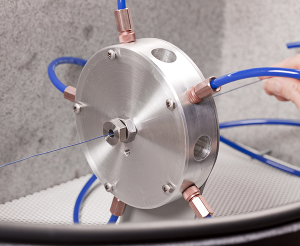 Unlike traditional sandblasting, a micro-abrasive stream is easy to control and delivers pinpoint accuracy. How Fine and How Small? Abrasive and nozzle selection are the two most important variables in controlling the MicroBlasting process. Micro-abrasives range in size from 17.5-350 µ and in hardness from 2-9 on the Mohs scale. Nozzles range in size from 0.018″ to 0.125″ and come in a range of shapes and lengths. 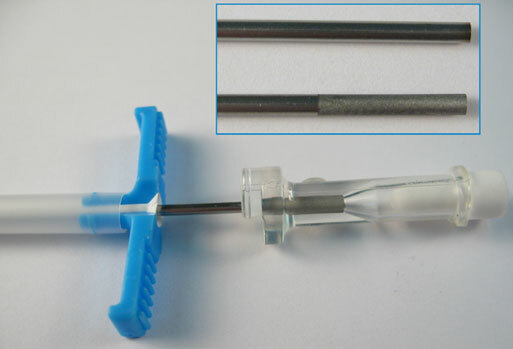 ✓ Deburr the heel on a 32 gauge cannula. 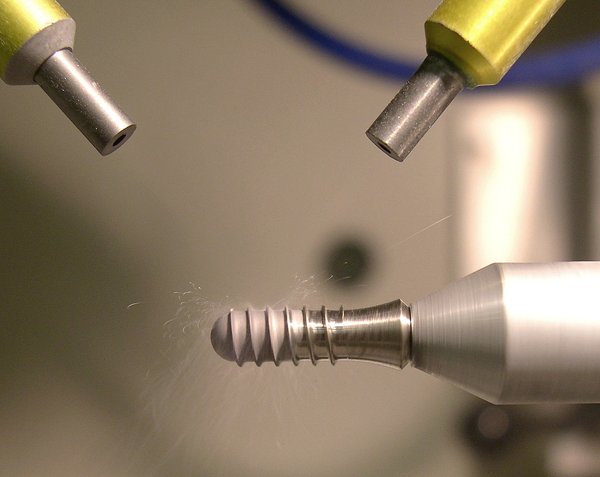 MicroBlasting efficiently deburrs PEEK implants without the usual risks. 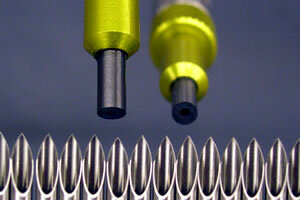 Unlike pick or knife deburring, operators can easily follow the contours of an implant using a rich abrasive stream flowing at a low pressure. Plus, an abrasive stream covers a wider area on the implant in a single pass. Sodium bicarbonate is the best media for this application. It is one of our softest abrasives and least likely to dig into the base surface of the implant. Yet, its needle-shaped particles are just sharp enough to cut off a feather burr at the root. Overblasting happens when an operator fixes an abrasive stream in one location for so long that it discolors or ‘burns’ a part surface. It is possible to overblast PEEK implants but easily avoidable. Hold the nozzle 1-2″ away from the implant surface. This allows the abrasive stream to fan out. Then, move the fanned stream in long, continuous and smooth passes over the implant. Each pass removes a few burrs at a time without damaging the part surface. Sodium bicarbonate is water-soluble—one more reason it is ideal. Any residual abrasive can be quickly cleaned off with an ultrasonic system and a solvent like deionized water or a mild acid. 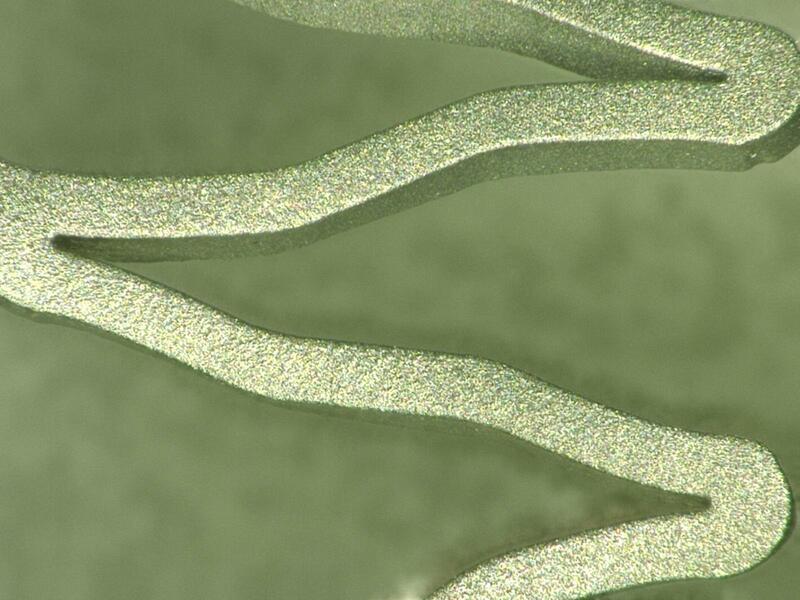 Laser machining or stamping of nickel-titanium alloys (Nitinol) create surface defects, like oxide layers, heat-affected zones (HAZ), and pulse marks. The expansion process turns these defects into potential sites of crack propagation. 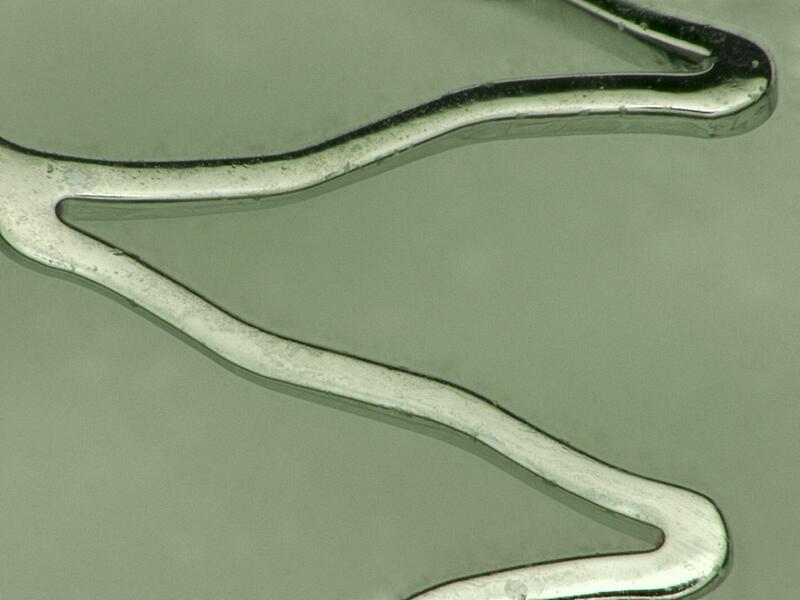 Nitinol requires a fine ceramic media like 17.5 µ aluminum oxide. Aluminum oxide registers as a 9 on the Mohs scale of hardness which means that it effectively transfers energy to a brittle oxide layer and shatters it away quickly. Fortunately, aluminum oxide particles are too blocky in shape to cut past the oxide layer into the ductile base material. Due to volume and precision requirements, this application requires automation. 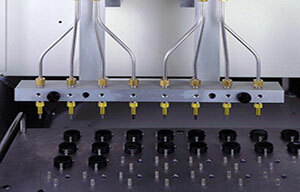 An automated MicroBlasting system can follow the profile of a stent ensuring uniform mass removal. MicroBlasting is also an excellent preparation tool for electropolishing. 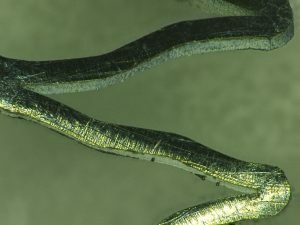 At the right nozzle distance and blast pressure, a micro-abrasive stream can create a uniform roughness, or matte finish, over the stent. While a matte finish may seem contrary to the goal of electropolishing, a uniform matte base speeds the polishing process. The more uniform the base, the more uniform the polish. Nozzle: Round, Hi/Performance nozzles for OD. Extended right-angle or custom for ID. The surface texture of a dental implant determines how quickly and smoothly the implant integrates into a jaw bone. Studies indicate that the surface of a dental implant needs to be more than just “rough.” Several surface characteristics impact the rate of integration. MicroBlasting controls two of these characteristics: Ra, the size of the surface peaks and valleys; and the developed surface, or the amount of surface area created through the texturing process. Automated systems produce the most consistent and repeatable surface textures on dental implants. 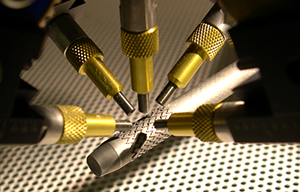 Automated systems are capable of creating surfaces as smooth as 10 µin or as rough as 200 µin. Comco technology in particular allows for careful control over particle velocity and coverage to create a consistently uniform surface. Bone screw makers face a few challenges. First, they must adhere to tight tolerances. Second, they use titanium. 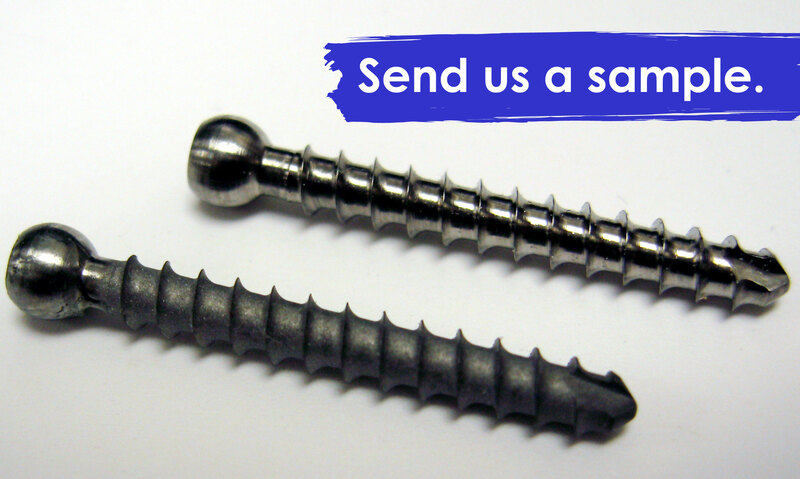 Titanium is an excellent material for bone screws, but it hardens as it heats up, making it tough to machine. 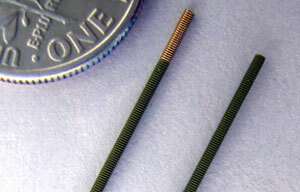 Third, fine feather burrs tend to form on titanium bone screws during manufacturing. These burrs must be removed without damaging or dulling the cutting edges on the screw. In the case of self-tapping screws, gentle removal is especially critical because it is easy to ruin the integrity of the flute. Two abrasives work best for this application: sodium bicarbonate and glass bead. Sodium bicarbonate is a soft abrasive commonly used for deburring sensitive materials and compositions. It gently removes burrs on a bone screw without dulling the cutting edges. Glass bead also gently removes fine feather burrs from bone screws, but it does more. Glass bead creates a compressive layer on the surface of the threads. This layer helps to improve the fatigue life on the bone screw. Over-blasting—or blasting too forcefully for too long or with too much abrasive—rounds or dull most part edges. There is a risk of over-blasting with glass bead. It is essential to acutely monitor blast time and coverage when using glass bead. Some bone screws require a second blasting application: texturing. 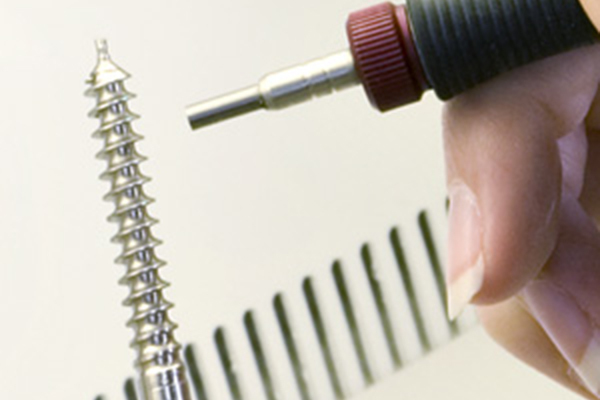 Texturing the surface on the head of the screw improves the mechanical bond with a swivel or another fixation device. MicroBlasting provides the precision to selectively texture this portion of the screw and using aluminum oxide to texture creates more surface area and greater points of contact between the screw and the device. It is well established that the onset and early stages of osseointegration are dependent on surface parameters such as roughness and developed surface. Previous studies have examined how different blast parameters affect the surface characteristics of implants with regard to aluminum oxide abrasives. 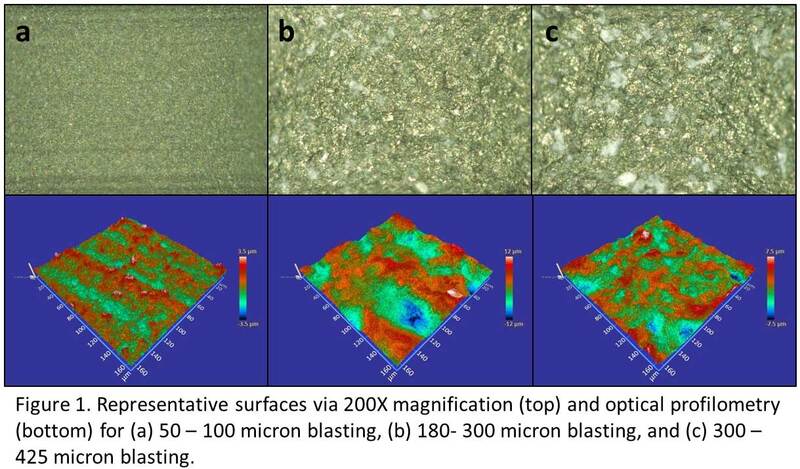 This research is now extended to include commonly used calcium phosphate blasting media supplied by MedicalGroup, Corp.
To evaluate the effect of media size, velocity, and coverage on surface roughness (Sa) and developed surface (Sdr) when using calcium phosphate blasting media. Grade IV titanium implants (internal thread, external hexagon) were used. Surface topography was assessed via optical microscopy with a Keyence microscope (200x) and via optical interferometry using a Zygo ZeGage optical profilometer to determine Sa (average surface roughness) and Sdr (amount of developed surface as a percent relative to a flat plane baseline). Optical microscopy and profilometry indicated that complete coverage was achieved for every processing parameter combination (Figure 1). Sa and Sdr parameters had the greatest dependence on media size and velocity. Coverage played a slightly bigger role in Sdr than it did in Sa. Figures 2 and 3 show the effects of size, velocity, and coverage on Sa and Sdr respectively. The surfaces created span a factor of 2 in developed surface and a factor of 4-5 in surface roughness with velocity and media size being the most important factors. Fig 1. Representative surfaces via 200x magnification (top) and optical profilometry (bottom). (a) 50-100 µ blasting, (b) 180-300 µ blasting, and (c) 300-425 µ blasting. This study was conducted in Comco’s Applications Lab by Dr. Jason McNary, Research Scientist; Comco, Inc. Burbank, CA. Deburr, texture, and clean medical implants and devices with the manual system. The AccuFlo® is the latest edition in our MicroBlaster® line. It is such a breakthrough in engineering that we had to give it its own name. Evolving out of 50 years of design and development, the AccuFlo is faster, delivers a more consistent abrasive feed, and features a more responsive pinch mechanism than its predecessors. The ProCenter Plus™ is a combination workstation and dust collection system housed in a freestanding unit. What makes this system ideal for medical applications? Processing a large volume of parts? Need more throughput than a manual system can provide? 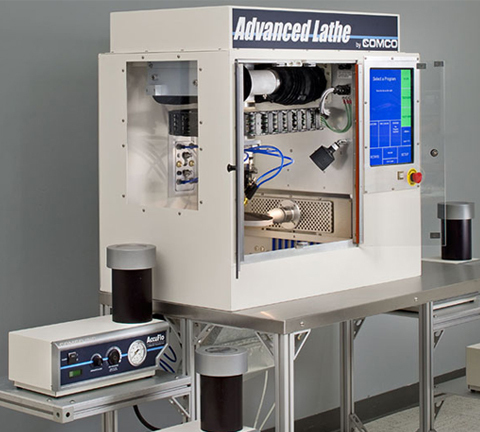 Comco automated MicroBlasting systems deliver all the benefits of our manual systems but with greater precision and efficiency for heavy production environments. Both the Advanced Lathe and the JetCenter are designed for the steady processing of precision parts. Each automated system is customizable from a proven platform and delivered as a turnkey solution. 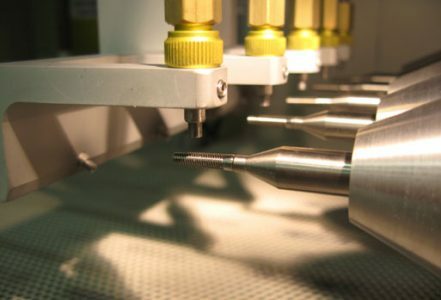 Many factors contribute to getting the right part surface: the size and hardness of the abrasive, the size and shape of the nozzle, air pressure, blasting time, nozzle position… and the list goes on. Our Applications Engineers have the tools to test these different variables and the experience to know where to begin. All test procedures and results are documented in a full lab report along with the tested sample parts for your team to evaluate. Check out our blog entry “We Take Samples Seriously” to learn more about our approach to testing, and contact a Sales Team Member today to have your sample part tested.